Hyundai penned the i40 at its Rüsselsheim design studio, where serious men do serious things. With pencils. 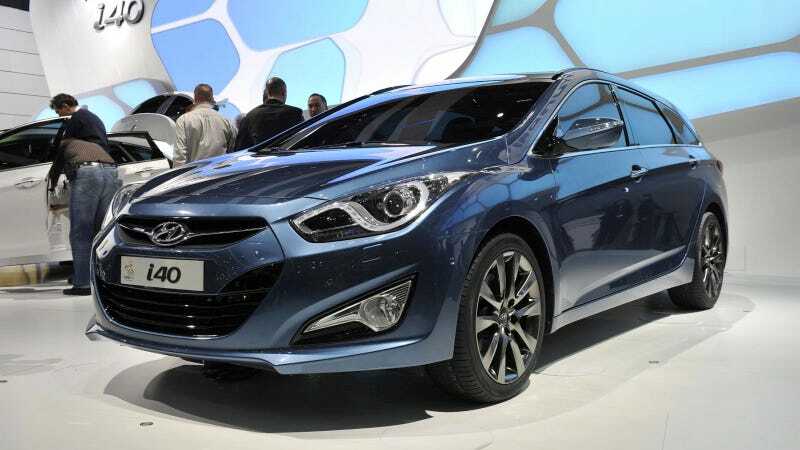 Nonetheless, Hyundai's i40 is a product designed with Europe in mind. So where's ours? That's a very good question. Oh, that's right; only the Germans get wagons now. That's because they buy them, and we buy eight-passenger luxobuses with enough A/V equipment to snuff out P.C. Richard. Our family transporters are so jacked up, they're just a shiny pole shy of delivering junior-college fratboys to get roofied in Atlantic City. Good luck disputing that $10,000 AMEX bill, Jason, you slobbering dickbag. Next time stay out of the "private" room. Anyway, the i40. It's a wagon, it's very nice, and we won't get it unless we promise to buy the goddamn things. Otherwise it's more whining from us trolls, wondering whose leg we have to hump to get a decent wagon in this joint. Get over it.